The other day I was installing Windows Home Server 2011 with two network adapters. Long story short I needed one to be a “Private network” and the other to be a “Public Network” but changing one adapter to a Public network ended up as a research exercise as the setting would not save. After spending many hours searching Google for a solution I found but one forum topic which suggested this which ended up saving me many more hours on such a simple task. 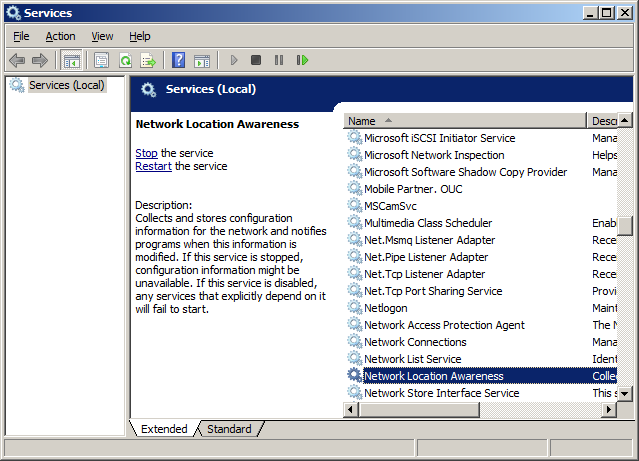 The Private/Public networks are controlled by the service: Network Location Awareness. Let’s disable that now by right clicking on that service and clicking Disable. >This might prompt you to disable other services as well, Say yes and continue till the process is complete. You can now set the other network adapter as a Public Network, Then reboot. During certain times of the year Wikipedia runs appeal notices on their website which can interfere with the end user experience. Below is a userscript modified from the original owner I have uploaded which removes those notices off the website. You may require an extension for your browser such as “Greasemonkey” to use this userscript. Right click the above link and download. Then import using GreaseMonkey/TamperMonkey. Please use this script at your discretion, I am by no means advising that you should not donate to Wikipedia as it is a very good educational tool and relies on the public donations to survive. EDIT: Userscripts is down, Link updated. EDIT 30/12/14: Wikipedia changed their code, updated script :). 4/11/16: From the latest iTunes version 12.5.2.36 you can no longer import the iTunes library/playlists into winamp. 12/07/14: I have uploaded a batch script that can be run to automatically clear all playlist files. Simply run the batch file each time before you open Winamp or whenever you need to clear out your old playlist files. If your a big Winamp fan like me but are forced to use iTunes after purchasing an iPhone then this may be the solution to your problems. I came to the point that on getting my iPhone I would now need to use iTunes for my music playback. I looked into several different options but with Winamp not being able to sync directly to the iPhone and no future development planned for it I was stuck. I finally came up with a way but whilst this way is a bit manual I found it works as best I can to still playback audio using my favourite media player Winamp whilst just using iTunes for all the music organising and sync for my iPhone. First off I’ll explain and guide you through what the best way I’ve found involves/doing. iTunes will become your big database of music/playlists etc so if you haven’t already, export your playlists from Winamp and import them into iTunes. [Optional] When in iTunes you should have similar options to like I have below. You can get to this page by going to “Edit > Preferences”. 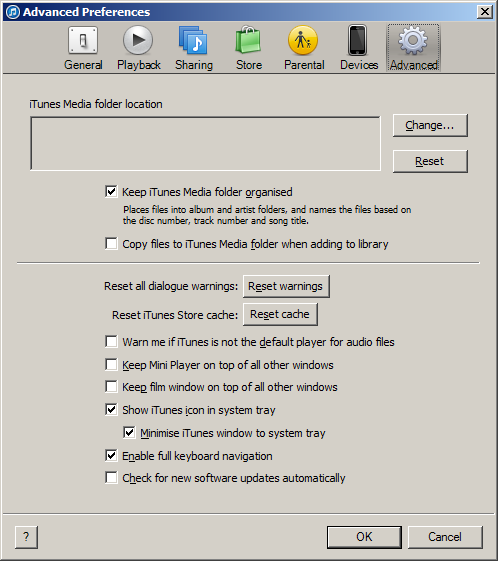 The next step – Assuming you have now setup your iTunes with all your playlists and media imported into it. Goto your Winamp media library/playlists directory. 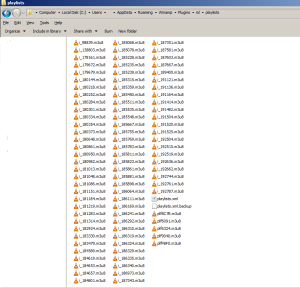 As you can see below there are quite a few playlist files (I’ll explain why later on). 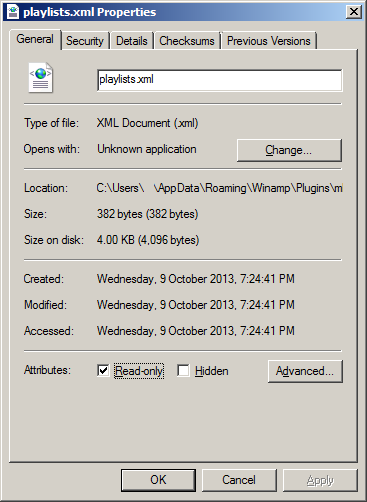 Now with Winamp closed, delete all the files ending with .m3u8 and playlists.xml. Now start Winamp again with this folder still open and you should notice no playlists appear in Winamp anymore, but the main thing is the playlists.xml file has recreated itself with a blank configuration. You now want to right click on the newly created playlists.xml file and goto properties and tick “Read Only” as seen below. With this done you have setup both the iTunes and Winamp parts successfully. Now is the part where I explain the manual tasks and what is needed by you to make this work. The first time you start Winamp you will be greeted with a blank media library and no playlists – This is good and will now happen each time you open Winamp. 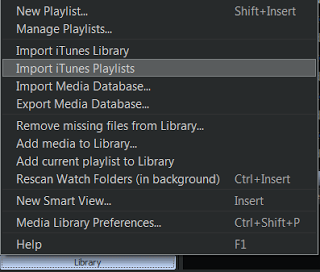 Now all you have to do to get your media into Winamp from iTunes is goto “Library > Import iTunes Playlists”. Your Winamp should freeze momentarily whilst it imports everything, this should take a maximum of 1 minute so be patient!. You should now have all your iTunes data in Winamp to playback as you wish. Each time you close Winamp and reopen it you will be greeted with the same blank media library window with no playlists and will have to manually click “Library > Import iTunes Playlists”. This is to ensure that if you update your media library within iTunes with new music you can successfully import it all to Winamp once you close and reopen it without duplicating playlists. Now comes the part which involves you doing maintenance. 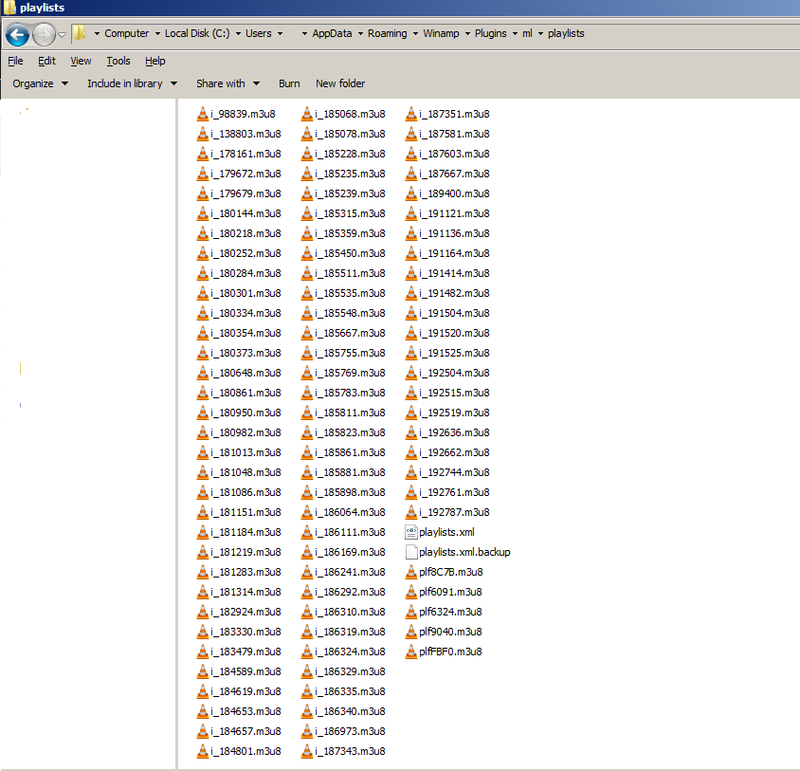 and should have similar filenames to: i_180354.m3u8. There may also be ones like: plf9040.m3u8. New playlist files will be generated each time you import with random file names. After awhile these add up. At the present time I haven’t found an application to automate this task but once and awhile you should manually delete these files to avoid them adding up too much. I have only encountered Winamp crashing once but cannot confirm it was because of the playlist files but there were 400+ at the time. For the last step I am sure you could write a batch file that automatically clears all playlist files with the extension “.m3u8” in that folder once a week for example. If I can find a suitable script I will update this post.